It can be assumed that the use of FinF technique can be adapted also to less advanced technology levels. The use of forward planning can be accomplished even without advanced treatment planning systems (TPS). It is conceivable that this technique can improve also the quality of treatments using the cobalt equipments; however, the possibility of FinF technique with a cobalt source is not granted due to lack of 2 useful elements to this technique: (a) The use of multileaf collimators (MLC) for the design of conformal treatments and (b) the possibility of photons of different energies. Therefore, before testing the FinF technique in the clinical trials, dosimetric evaluations, and comparisons with the standard (wedged fields) technique are needed. Thus, given these premises, the purpose of this analysis is to evaluate the feasibility and the dosimetric results of a simplified IMRT treatment for breast cancer with a cobalt-therapy unit. A retrospective cohort of 14 patients who underwent conservative surgery and adjuvant breast irradiation with three-dimensional conformal radiotherapy (3D-CRT) technique were selected for this study. This group included seven patients with the left side involvement and seven with the right side involvement. The patients had different characteristics in terms of anatomical site of the tumor and the size of the residual breast. In order to perform a dosimetric comparison, a computed tomography (CT) -simulation was carried out with patients positioned supine on breast board with the ipsilateral arm raised above the head. The scan was extended from the jugular notch to 5 cm below the lower edge of the breast with a scan interval of 5 mm. Target volume, heart and lungs were manually contoured on each CT slice by a single radiation oncologist (LC) following the RTOG guidelines. The clinical target volume (CTV) was defined as the remaining breast excluding the outer 5 mm. The planning target volume (PTV) was defined as CTV + 8 mm in the direction of the chest wall. Oncentra Masterplan version 4.0 treatment planning system (Nucletron B.V., Veenendaal, and The Netherlands) was used to generate 4 different treatment techniques that are described below. For all plans, a fractionation schedule of 50 Gy in 2 Gy/fraction to the PTV was used. All plans were optimized according to the following constraint for the PTV: V 95% >95% (the volume receiving 95% of the prescription dose or more) must be greater than 95% of the PTV volume). This was considered as the primary constraint. As a secondary constraint, we considered the following: Maximum dose (D 2% ) to the PTV < 107% of the prescribed dose. All plans were performed with the tangential technique and slight beam orientation (gantry angles optimized to match divergence of the posterior edges of the beam) to avoid contralateral breast irradiation and minimize the ipsilateral lung area in the beam's eye view (BEV). For all patients, a standard tangential wedged plan (Co60-WF) and a plan based on the FinF technique (Co60-FinF) were carried out. In the standard wedged treatment, irradiation of the PTV was planned with 2 tangential beams produced by a cobalt-60 source, with 15° or 30° wedge filters used to compensate the dose inhomogeneity. In the FinF treatment, the dose on each of the 2 tangential beams was split into 2 different segments. The first segment was designed to encompass the entire breast without the use of filters [Figure 1]a. This configuration in the absence of filters generally produces a volume of under-dosing in the central and deep region of the breast being the region with greater thickness. A second segment was then directed to this area of under-dosing, in order to compensate for the drop in dose [Figure 1]b. The weights of the 2 segments were determined with an iterative process repeated until optimal results are achieved. The weight of these segments is typically in the range of 15-20%. The 2 segments have a rectangular shape without shielding. For comparison purposes, a standard treatment plan using only open fields (Co60-OF) without wedge filters was generated. All cobalt plans were generated with the beam parameters of a Theratron machine (Best Theratronics Ltd, Canada). For each patient, the 6-MV photon standard wedged tangential treatment plan (6MV-CRT) used for clinical irradiation was also considered for comparison purposes. In this last technique, MLC were used in order to minimize normal tissue (lung and heart) dose without compromising the target coverage. The shape of the MLC was defined in the BEV with a distance of 7 mm from the PTV in the lung region to take into account for beam penumbra. These plans were generated with the 6 MV beam parameters of an Elekta Precise linac (Elekta, Crawley, UK). The dose specification was performed according to ICRU 62. In all techniques, the dose calculation was carried out using the pencil beam algorithm with inhomogeneity correction and a dose grid resolution of 0.2 cm. Dose-volume histograms were generated for PTV and organs at risk for all plans. For PTV, D mean , D 98% , D 2% , V 95% , V 110% and a homogeneity index (HI) defined as HI = 100 × (D 2% -D 98% )/D p (D p = prescribed dose) were chosen as parameters for comparison. D mean , D 98% , D 2% were calculated as percentages of the prescribed dose (50 Gy). D 98% and D 2% were defined as surrogates for maximum and minimum doses. Lower HI values indicate a more homogeneous target dose. V 110% was chose to specify the target volume receiving high doses. In addition, a conformity index CI was defined as CI = Vri/Vptv, where Vri is the volume encompassed by the reference isodose for the PTV (95% of the prescribed dose) and Vptv is the PTV volume. For ipsilateral lung and heart, plans were compared in terms of D mean , D 2% , V 10 Gy , V 20 Gy , V 30 Gy , V 40 Gy and V 50 Gy . One-way analysis of variance was used to compare dosimetric differences among plans using the 4 techniques. Post-hoc testing was assessed using the Bonferroni multiple comparison adjustment method; P < 0.05 were considered significant. The Statistical analyses were performed using Statistical Package for the Social Sciences (SPSS) software (SPSS Inc., Chicago, IL, USA). Fourteen patients were included in this analysis. Patients' characteristics are reported in [Table 1]. The analysis results for target coverage are reported in [Table 2] in terms of the mean value and standard deviation. [Figure 2] shows the PTV box-and-whisker plot for the 4 techniques. Median breast volume was 654.5 cc (range 260.0-1365.1 cc). In all patients, as provided for in the study design, the constraint V 95% >95% were achieved for all plans. Concerning the PTV, the Co-FinF technique improved the dose homogeneity compared to other Co60 techniques. In particular, Co-FinF reduced maximum doses (D 2% ) by 2.9 Gy (P < 0.001) and 1.8 Gy (P = 0.027) compared to Co-OF and Co-WF, respectively. High doses volume (V 110% ) were reduced to 7.5% with the use of Co-FinF, from 22.1% (P < 0.001) to 10.0% (P = 0.042) of Co-OF and Co-WF, respectively. Mean homogeneity index was significantly improved with Co-FinF (19.5) as respect to Co-WF (23.0, P = 0.042) and Co-OF (25.6, P < 0.001). The CI over the 14 patients for all of the four different techniques is shown in [Figure 2]e. The results show that mean CI is higher for Co-WF than for Co-FinF (2.6 vs. 2.2, P < 0.001) and no significant different as respect to Co-OF (P = 0.289). [Figure 3] shows the dose distribution for one representative patient in terms of isodoses equal to 95%, 105%, 110%, and 115% of the prescribed dose on the axial slice and coronal view containing isocenter. The advantages of Co-FinF are clearly evident in terms of reduction of areas irradiated at high doses, which are mainly present in the breast anterior region for Co-OF technique and in the breast portion close to the lung for the Co-WF technique. Normal tissue dosimetric results are displayed in [Table 3] in terms of the mean value and standard deviation. 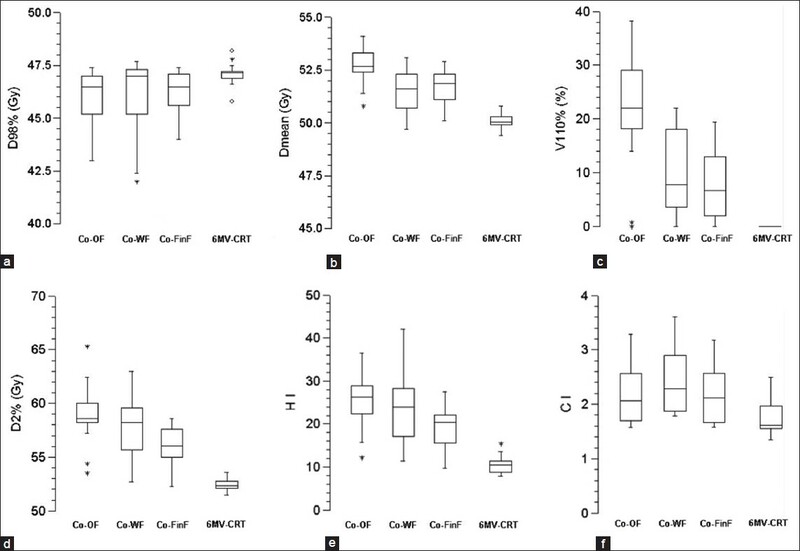 For ipsilateral lung, all parameters used to analyze the lung irradiation showed that significant improvements are obtained with Co-FinF technique with respect to Co-WF technique [Table 3]. Mean lung dose reduced from 12.1 Gy for the Co-WF plans to 9.8 Gy for the Co-FinF technique (P < 0.001). Similarly, D 2 dropped from 52.3 Gy for the Co-WF plans to 46.9 Gy for the Co-FinF plans (P < 0.001). In addition, lung irradiation reduced at all dose levels [Table 3]. For the seven patients whose left breast was considered, Co-FinF technique shows a slightly improvements in all dosimetric considered parameters for the heart irradiation [Table 3]. Both for the ipsilateral lung and heart, Co-FinF show no significant differences respect to Co-OF technique. Contralateral breast maximum dose (D 2 ) was lower for Co-FinF compared to Co-WF (P = 0.009). A preliminary assessment on the feasibility of FinF technique with a cobalt source for the post-operative treatment of breast cancer has been performed. The results of this analysis showed that FinF technique can replace the use of filters to optimize the dose distribution despite the limitations of cobalt machine. It was also found out that the dose distribution with the FinF technique is slightly superior to that obtained with wedge filters. In fact, compared to the wedge filters technique, FinF technique is able to reduce the hot-spot areas and dose to lung and heart. Therefore, FinF may be useful as an optimization possibility compared to standard treatment. Particularly, it may be more useful in centers with the unfiltered cobalt equipment. Our analysis has some limitations. Treatment plans were created using a CT-simulator and a 3D TPS, not necessarily available in centers with limited technology. Furthermore, treatment plans have been performed by an "expert" operator. To overcome these limitations and make available a standardized methodology, a class solution based solely on the traditional simulator and 2D TPS is currently developing. In this analysis, only 2 segments per field were used. It is possible that the use of a greater number of beams can produce better dosimetric results. In particular, it may be possible to further reduce the dose hotspots, which are still significant (110-115%), by using more and better shaped segments by means of blocking devices or MLCs. Our choice was motivated by the fact that with cobalt machines, the use of this technique requires a double field size change and beam positioning for each field. The use of a greater number of segments in our opinion would prolong the treatment duration considerably to an unacceptable level. However, in case of asymmetric collimators based machine,  the use of a greater number of segments might be feasible without a significant treatment time prolongation. Some previous studies showed the possibility of performing IMRT treatments with a cobalt machine. In one case, it was a theoretical analysis based on a telecobalt model equipped with MLC. In another case, a single case of breast cancer patient was reported for whom a mixed conformal-IMRT was suggested. Therefore, unlike these studies, our analysis was based on a "real" situation and on a simplified technique theoretically feasible in all radiotherapy departments. There is higher dose homogeneity and reduction of hot-spot regions thus the FinF treatments may encourage the use of accelerated-hypofractionated treatments with the cobalt sources. The Standardization of Breast Radiotherapy Trials studies, in fact, have shown the equivalence between standard and hypofractionated regimes. , The adoption of accelerated-hypofractionated schemes would be particularly useful in developing countries, given the lack of facilities and equipment. Hopefully, greater availability of postoperative radiotherapy by the adoption of these accelerated treatments, may promote the spread of conservative treatment in these countries. A forward-planned IMRT technique, in a field-in-field approach, can be easily implemented in post-operative breast cancer radiotherapy for resource deficient cancer centers world-wide utilizing the cobalt-60 treatment units. Despite cobalt machine limitations, this technique can replace the use of filters to optimize the dose distribution. 1. Boyle P, Howell A. The globalisation of breast cancer. Breast Cancer Res 2010;12:S7. 2. Akarolo-Anthony SN, Ogundiran TO, Adebamowo CA. Emerging breast cancer epidemic: Evidence from Africa. Breast Cancer Res 2010;12:S8. 3. Bese NS, Munshi A, Budrukkar A, Elzawawy A, Perez CA, Breast Health Global Initiative Radiation Therapy Focus Group. Breast radiation therapy guideline implementation in low- and middle-income countries. Cancer 2008;113:2305-14. 4. Hurkmans CW, Meijer GJ, van Vliet-Vroegindeweij C, van der Sangen MJ, Cassee J. High-dose simultaneously integrated breast boost using intensity-modulated radiotherapy and inverse optimization. Int J Radiat Oncol Biol Phys 2006;66:923-30. 5. Singla R, King S, Albuquerque K, Creech S, Dogan N. Simultaneous-integrated boost intensity-modulated radiation therapy (SIB-IMRT) in the treatment of early-stage left-sided breast carcinoma. Med Dosim 2006;31:190-6. 6. Selvaraj RN, Beriwal S, Pourarian RJ, Lalonde RJ, Chen A, Mehta K, et al. 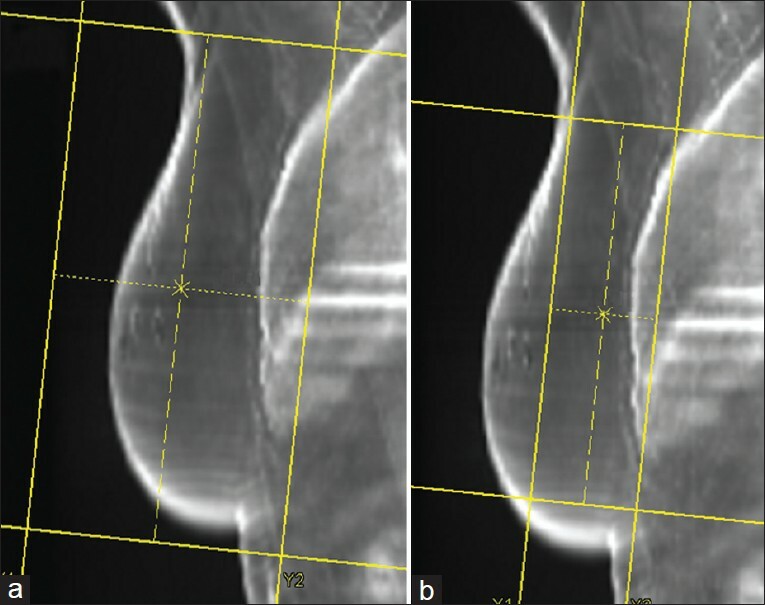 Clinical implementation of tangential field intensity modulated radiation therapy (IMRT) using sliding window technique and dosimetric comparison with 3D conformal therapy (3DCRT) in breast cancer. Med Dosim 2007;32:299-304. 7. Jain P, Marchant T, Green M, Watkins G, Davies J, McCarthy C, et al. Inter-fraction motion and dosimetric consequences during breast intensity-modulated radiotherapy (IMRT). Radiother Oncol 2009;90:93-8. 8. 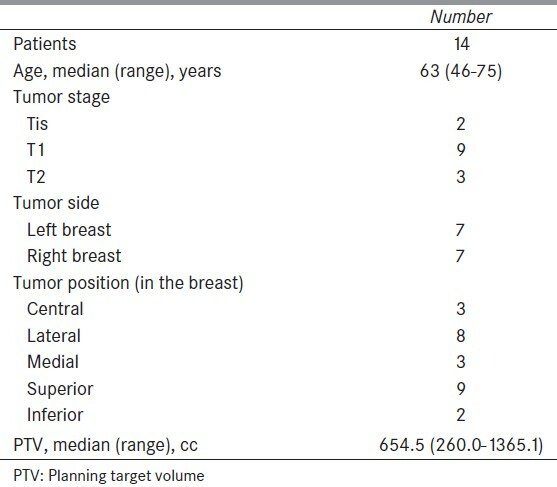 Smith W, Menon G, Wolfe N, Ploquin N, Trotter T, Pudney D. IMRT for the breast: A comparison of tangential planning techniques. Phys Med Biol 2010;55:1231-41. 9. Donovan EM, Yarnold JR, Adams EJ, Morgan A, Warrington AP, Evans PM. An investigation into methods of IMRT planning applied to breast radiotherapy. Br J Radiol 2008;81:311-22. 10. Burmeister J, Alvarado N, Way S, McDermott P, Bossenberger T, Jaenisch H, et al. Assessment and minimization of contralateral breast dose for conventional and intensity modulated breast radiotherapy. Med Dosim 2008;33:6-13. 11. Lohr F, El-Haddad M, Dobler B, Grau R, Wertz HJ, Kraus-Tiefenbacher U, et al. Potential effect of robust and simple IMRT approach for left-sided breast cancer on cardiac mortality. Int J Radiat Oncol Biol Phys 2009;74:73-80. 12. van der Laan HP, Dolsma WV, Schilstra C, Korevaar EW, de Bock GH, Maduro JH, et al. Limited benefit of inversely optimised intensity modulation in breast conserving radiotherapy with simultaneously integrated boost. Radiother Oncol 2010;94:307-12. 13. Freedman GM, Anderson PR, Li J, Eisenberg DF, Hanlon AL, Wang L, et al. Intensity modulated radiation therapy (IMRT) decreases acute skin toxicity for women receiving radiation for breast cancer. Am J Clin Oncol 2006;29:66-70. 14. Morganti AG, Cilla S, Valentini V, Digesu' C, Macchia G, Deodato F, et al. Phase I-II studies on accelerated IMRT in breast carcinoma: Technical comparison and acute toxicity in 332 patients. Radiother Oncol 2009;90:86-92. 15. Tromm E, Meyer A, Frühauf J, Bremer M. Partial-volume segmentation for dose optimization in whole-breast radiotherapy: A comparative dosimetric and clinical analysis. Strahlenther Onkol 2010;186:40-5. 16. Barnett GC, Wilkinson JS, Moody AM, Wilson CB, Twyman N, Wishart GC, et al. Randomized controlled trial of forward-planned intensity modulated radiotherapy for early breast cancer: Interim results at 2 years. Int J Radiat Oncol Biol Phys 2012;82:715-23. 17. van Asselen B, Schwarz M, van Vliet-Vroegindeweij C, Lebesque JV, Mijnheer BJ, Damen EM. Intensity-modulated radiotherapy of breast cancer using direct aperture optimization. Radiother Oncol 2006;79:162-9. 18. Mihai A, Rakovitch E, Sixel K, Woo T, Cardoso M, Bell C, et al. Inverse vs. forward breast IMRT planning. Med Dosim 2005;30:149-54. 19. Murthy KK, Sivakumar SS, Davis CA, Ravichandran R, El Ghamrawy K. Optimization of dose distribution with multi-leaf collimator using field-in-field technique for parallel opposing tangential beams of breast cancers. J Med Phys 2008;33:60-3. 20. Morganti AG, Cilla S, de Gaetano A, Panunzi S, Digesù C, Macchia G, et al. Forward planned intensity modulated radiotherapy (IMRT) for whole breast postoperative radiotherapy. Is it useful? When? J Appl Clin Med Phys 2011;12:3451. 21. Barton MB, Frommer M, Shafiq J. Role of radiotherapy in cancer control in low-income and middle-income countries. Lancet Oncol 2006;7:584-95. 22. Kigula Mugambe JB, Wegoye P. Pattern and experience with cancers treated with the Chinese GWGP80 cobalt unit at Mulago Hospital, Kampala. East Afr Med J 2000;77:523-5. 23. van der Giessen P. Design, construction, and performance of an asymmetrical collimator for a cobalt unit. Int J Radiat Oncol Biol Phys 2001;49:265-71. 24. Fox C, Romeijn HE, Lynch B, Men C, Aleman DM, Dempsey JF. Comparative analysis of 60Co intensity-modulated radiation therapy. Phys Med Biol 2008;53:3175-88. 25. Adams EJ, Warrington AP. A comparison between cobalt and linear accelerator-based treatment plans for conformal and intensity-modulated radiotherapy. Br J Radiol 2008;81:304-10. 26. START Trialists' Group, Bentzen SM, Agrawal RK, Aird EG, Barrett JM, Barrett-Lee PJ, et al. The UK Standardisation of Breast Radiotherapy (START) Trial A of radiotherapy hypofractionation for treatment of early breast cancer: A randomised trial. Lancet Oncol 2008;9:331-41. 27. START Trialists' Group, Bentzen SM, Agrawal RK, Aird EG, Barrett JM, Barrett-Lee PJ, et al. The UK Standardisation of Breast Radiotherapy (START) Trial B of radiotherapy hypofractionation for treatment of early breast cancer: A randomised trial. Lancet 2008;371:1098-107. 1 Cobalt, Linac, or Other: What Is the Best Solution for Radiation Therapy in Developing Countries?